Sometimes all it takes is some sweet music to keep the most ferocious of beasts at bay. The Minstrel, equipped with his or her intrument, aids the party with songs of valour and might, whilst striking fear into the hearts of their enemies with forboding melodies. Minstrels tend to have long hair and wear leather jackets, often with patches sewn on depicting their favourite minstrels. Sometimes they form bands and tour the world for fame and fortune. Each intrument has a level that reflects its cost. A 10 gold instrument is level 1, 20 gold is level 2, 30 gold is level 3 etc. Instruments can only cast spells of their level or below. Instrument levels have the same attribute requirements as spell levels, so you must have the correct attributes to cast instrument spells. Fight for honor, glory, death in fire"
Effect: You play a viking-like melody that imbues your allies' weapons with magical fire for one combat round. If your allies win the round, all enemies hit must make a L2SR on CON or extra damage equal to your INT. Power-up? Yes - add a level for the saving roll. Turned around and no-one's there." Effect: Your song paralyses your enemies with fear. Enemies halve their HPT for one round. Power-up? - Yes - double the duraton. We're off to never never land"
Effect: Your song puts your enemies into a deep slumber. Enemies will sleep until attacked. Effect: You call forth the fire of the great dragonlords. Enemies take 4d6 damage. Welcome to the first Fighting Fantasy Newspunch, where I talk about the latest goings on in the Fighting Fantasy universe. House of Hell, the only modern horror Fighting Fantasy book, is being translated into an ambitious film project that looks like it's going to be pretty special. Superteam are guiding us all the way with their video logs, showing us the new studio, the crew and giving us some insight into what this venture will look like when it's released. Take a look! Creature of Havoc is definately one of the most bizarre of the gamebooks that sees you take on the role of a beast who has lost its memory and must uncover clues to its past life. Now you can play this excellent adventure on your iPod Touch, iPhone or iPad. Coming soon to the Playstation Network is the first in the line of 'minis', which is based on Talisman of Death (one of my personal favourite books). To keep both existing fans and newcomers happy with their treatment of the license, Laughing Jackal have included ‘Classic’ and ‘New’ game modes. The ‘Classic’ game mode very closely emulates the format of the original books, while the ‘New’ mode adds a range of all-new features to really capitalise on the console medium, providing greater visual excitement and giving power to the player, rather than to arbitrary ‘virtual dice rolls’ which the player can’t influence. · ‘Classic’ mode – experience Fighting Fantasy in its original format, with classic dice-rolling combat. · ‘New’ game mode – featuring additional game features exciting combat and brand new SKILL tests. · Brand new character creation system, combining the best of the old with all-new presentation. 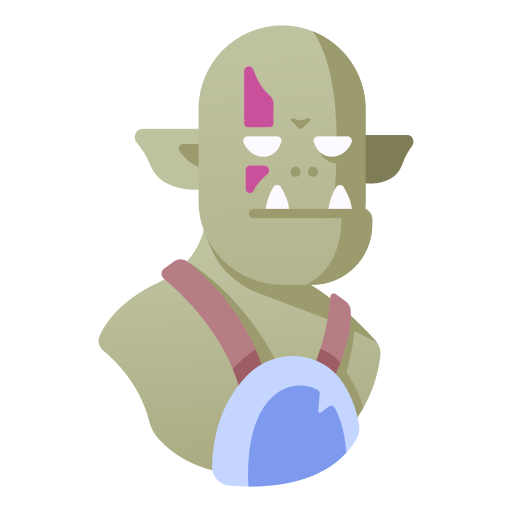 · Character Biographies – learn more about the people and creatures encountered on your adventure. · Item Biographies – gain insight into the uses and pitfalls of the various items you’ll find. · Page Biographies – Keep track of which areas of the book you’ve visited, and exactly what you did there. Check out the official Fighting Fantasy website to play October's amateur adventures for free. Oh James Shipman, why do you do it? Most people in the T&T community and, thanks to widespread blogging, a lot of people outside this circle, know about James Shipman, the guy who used a whole load of artwork without the artists' consent and never paid them a penny. For some reason, even after a firmly-worded open letter from Ken St. Andre, he's still producing T&T materials. I'm sincerely hoping that these are all legit, but it may be best not to buy anything from him. Like many of you, I ran a Halloween themed game this week to get everyone in the mood for the most delicious of holidays. This week just happened to be our 'new game week' where we try out a new rpg every last Thursday of the month. 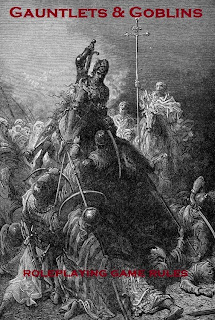 I really couldn't be bothered to teach new rules to the group, so I decided to introduce them to the ultra rules-lite Risus. I was also too busy to write up an adventure, but I had two ideas in my head that I'd been playing around with for a couple of days. The first put the players in the shoes of classic monsters, like the wolfman etc. Their task was to get as much candy as possible, but they would have ended up being arrested and I envisioned them eventually appearing on a daytime talk show. The other idea was the one I eventually went with: a teen slasher flick. Since I didn't have the time to write anything, I took a few ideas and used the Mythic GME to carry the story along. I thought this could either turn out really well or fail miserably. Fortunately we had a blast, even if we didn't get to finish it. My group aren't big roleplayers, so this was a great vehicle to get them roleplaying more, as Risus is very rules-lite and there was little conflict. The Mythic GME made things unpredictable and often had hilarious consequences, as well as some moments that genuinely terrified the players (serial killer walking around the school with a machete will do that). I definitaly recommend using Mythic and Risus together. The lack of strict rules allows for some great freeform roleplaying and helps keep the flow of the game. Mythic tends to also work well with T&T and Barbarians of Lemuria if you're wanting some fantasy goodness. I have very little spare time in my life, but I've decided to use what's left of it to write an RPG; something I've been wanting to do since I was a kid. The working title is currently Gauntlets and Goblins, which I want to be an old school fantasy game but now derived from OGL. I love Labyrinth Lord and its ilk, but that's been done now and I want to create something new. I have some rough mechanics at the moments that borrow from game like World of Darkness, Tunnels and Trolls, Risus and D&D but I've kept them pretty simple so it's easy to pick up and play. G&G is fantasy, but not D&D fantasy. 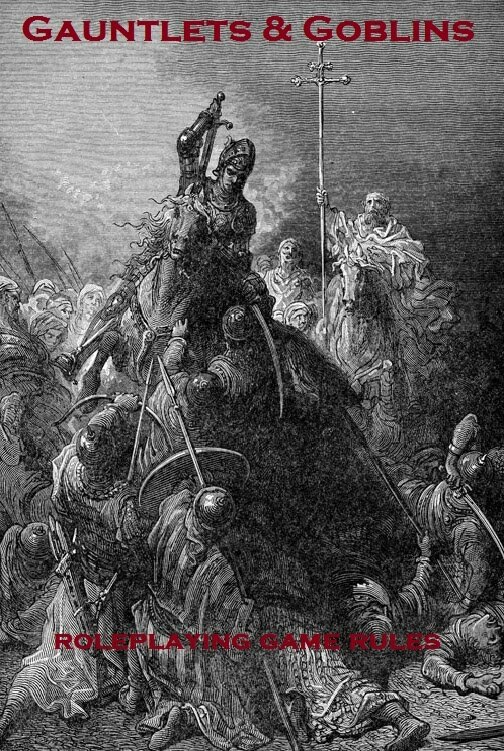 I'm going for a more Arthurian feel with noble knights and classic sorcerers, whilst making heavy use of British folklore. So creatures you will fight won't be beholders and gelatinous cubes - they'll be a black dogs, hags, goblins, green men, boggarts and brownies. It's going to have a very British feel to it and a big focus on our great countryside. Right now I have three classes: Knight, Sorcerer and Archer. I am planning two more, but I won't be having different races, so everyone will be human. This is both to keep the game simple and to give a better representation of Britain's mythical history. I'll keep you updated as I plod on with this. I'm hoping to have it completed by February and put it online to download for free, so even if you hate it you can't complain that you've wasted your money. Sometimes RPGs can be a tad too serious. Obviously Tunnels and Trolls, the roleplaying love of my life, is a humourous game, but many games can be not all that lighthearted. So it's refreshing to get my hands on a mainstream game that is high quality and hilarious to boot. D&D Gamma World is that game. Gamma World has been around for aeons, first published by TSR in 1978 as a sci-fi alternative to Dungeons and Dragons. 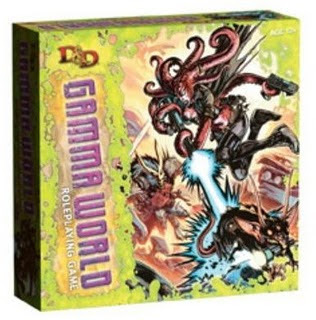 Now in its seventh iteration, Gamma World brings the bizarre post-apocalyptic world to a new legion of gamers, not least because it's directly tied to the 4th edition D&D rules. It's tradition in each new edition of Gamma World to change the origin story of why the world is now a nuked wasteland, and this is no different. Appealing to real-world events, this new edition tells the story of how the Large Hadron Collider in Geneva brought together hundreds of universes with their own timelines simultaneously. This would come to be known as The Big Mistake. In most of the timelines nuclear war had occurred, so when the merged realities finally stabilised what was left was a post-apocalyptic wasteland full of bizarre creatures and alien technology. So what do you get for your hard-earned money? Gamma World comes in a nice box with some gorgeous artwork. Inside everything is compact; you get a 160 page rulebook, 2 beautiful double-sides maps, 2 card stock sheets of push-out monster tokens, 4 character sheets and 80 cards as well as an 8 card booster. The box could have probably been smaller, expecially because the rulebook is a very compact size, unlike the D&D core rules, but all in all it's nicely presented. The game itself is powered by 4th edition D&D, so if you're already familiar with 4e rules then you can whizz through a fair chunk of the book. The main feature in Gamma World has to be character creation. Unlike 4e, rolling up a character here is fast and easy. There aren't pages of powers to pour over and you certainly don't have to plan your character's career path. Here you roll twice on an origin table to get your primary and secondary origins. You see, Gamma World isn't about fighters, clerics and wizards; it's all about the freaky mutants. You could end up being a cat person that fires electricity, a yeti who can use the force, or even a swarm of duplicting rats. Some people will be put off straight away by the silliness, but it's refreshing to see a modern RPG that just says "screw it, I'm going to have wacky fun". One of the first things that a D&D 4e veteran will notice is the lack of powers for each character. Each origin has a power to begin with, so you will begin with two. However, this is where the cards come in. There are Alpha Mutation and Omega Tech cards in the 80 card deck. Alpha Mutations occur at the beginning of each encounter, when the player rolls a 1 and optionally after an extended rest. This requires drawing a card from the Alpha Mutation deck and 'readying it'. These are encounter powers that disappear once used. Having these random mutations, which could make you telepathic, able to manipulate gravity or maybe grow new arms, makes up for the lack of powers your characters have. What's more is that youcan choose to 'overcharge' the power by rolling a d20. A roll of 10 or more means that power has a more powerful effect, but 9 or less means an epic fail. So you could end up with four arms or none at all, depending on how you roll. Omega Tech is similarly drawn from the deck (either your contructed deck or the GM's) when the GM says so. Some of these are incredibly powerful, so you can see how deadly a game Gamma World is, especially as you don't get healing surges like in D&D 4e. If you are of the required level, you can salvage the weapon; meaning you can keep it but it has a weaker effect. Drawing mutation and tech cards lends some randomness to the game, since you don't know what may happen to you next. Players can build their own decks to suit their character, which at least puts a bit more strategy into a fairly chaotic game. Don't expect long campaigns in Gamma World, as the level cap is 10 (although there are some home-rules for levels 11-20 on the interwebs) and levelling is quick as characters only need 1000xp for the majority of the levels. Also, you'll be dying quite a bit, I reckon, so it's a good job characters are quick to roll up. The rules also include a pretty uninspiring adventure which is basically a series of encounters. My GM has chosen to skip running this and write his own, but let me know how you got on if you have played it. The book also contains some monster stat blocks with some nice looking art. You can even import D&D 4e monsters into your game, since they use exactly the same stats, which means that your Monster Manuals are now handy for two games. D&D Gamma World is a balls-to-the-walls game that doesn't take itself too seriously. Being able to roll up characters quickly and randomly is great for the feel of the game, but it may put off those players who like optimisation. However, if you're looking for post-apocalyptic fun where anything is possible, you should really invest in this game. There are two expansions on the horison promising new adventures, monsters and, most importantly, origins. Apparently the game is selling well so hopefully there will be some official support by Wizards in the long run, but I wouldn't count on it. Either way, Gamma World will certianly be supported by eager fans. A couple of weeks ago I made a teaser post with an image of A.R. Holmes' massive solo Castle Death. I'm now revealing that very soon (i.e. when I have some free time) I am going to be liveblogging a run through Castle Death. I figure that death will come to my character hard and fast, 'cos y'know it's in the title, so I've decided that I will have a maximum of three characters that can try their luck at unearthing the fortunes in the castle. Once one delver dies he will be replaced by another one. I don't expect to actually make it through the dungeon in one piece, but I'm going to give it a good shot and hope for the best. So watch this space for more information about the date and time Castle Death Live is taking place. 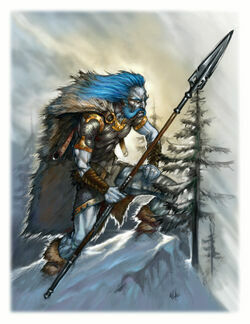 In the harsh world of Blashyrkh there are few creatures that can match up to the supreme might of the Frostwalker Giants. Created by the Wintergods, these hulking beasts live in mammoth caverns underground, occasionally surfacing to disrupt a trade route by eating whoever is passing. These giants clad themselves in Thunderbeast fur, which they hunt on the barren fields of Krakish, using huge spears wittled from an entire tree trunk. Every now and again, when they are very hungry, Frostwalkers will attack neighbouring settlements, so many towns such as Snowhaven and Gaunt have erected great walls to keep the massive monsters away. Special damage: 15 spite/ Hurl - the Frostwalker picks up the closest attacking target and throws them into anything hard (i.e. a cave wall). That target cannot take an action in the next round of combat and must make a L7SR- CON or be out of action for 3 further rounds. I'm in the mood for some Carcass. Yes, I even liked them when they went melo-death in Heartwork. In fact, I may even prefer them that way. 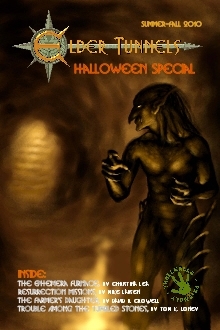 Halloween is just around the corner and to coincide, the awesome Peryton Publishing have released a spooooky-scary edition of Elder Tunnels, introduced by yours truly. Within these pages lurk horrifying adventures by a group of ghoulish writers. ‘The Ephemera Furnace’ by the sinister Christina Lea will chill you with a tale of disembodied limbs and groaning zombies. ‘The Farmer’s Daughter,’ a solo adventure by the twisted David Crowell will give you nightmares of scarecrows, cattle mutilations, and things that go bump in the night. Finally, in ‘Trouble among the Tumbled Stones,’ the foul Tom K. Loney will take you on a terrible journey to a place where travellers have been vanishing mysteriously. Could this be the work of bandits, or is something more disturbing afoot on the road to Grimehaven? 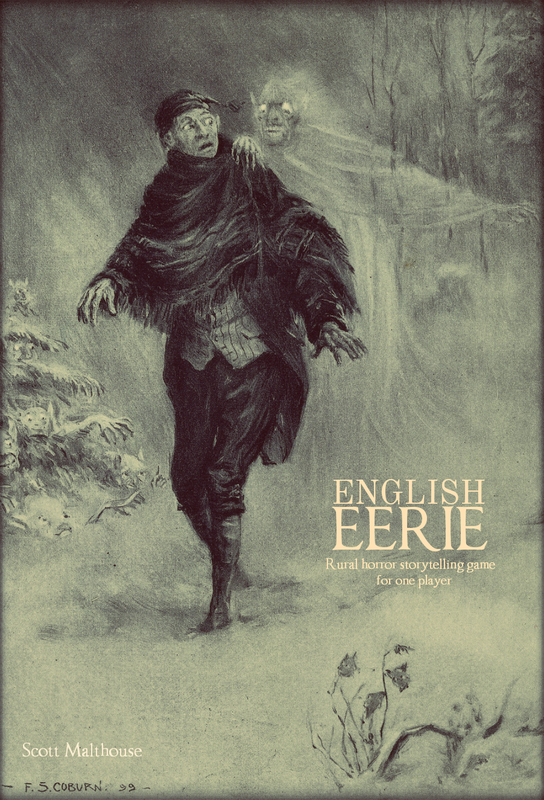 Go buy it and show your players a cracking Halloween adventure. Muhahahaha! You may remember that not so long ago Ken St. Andre decided to write a multi-part history of Trollworld on his blog. His chronology went down a storm amongst T&T fans so by popular demand he had it published through Peryton Publishing. It's an excellent resource for any T&T player so you should really go and buy it. I count myself first and foremost as a journalist, even though it's not my main source of income. One of my latest reviews which will be featured in the next issue of Thirteen1 was Alien Breed 2: Assault. I loved the first Alien Breed and even interviewed the developer, Team 17, about it, and I was more impressed by Alien Breed 2. One of the reasons I really like this series is because it feels like a dungeon crawl, and I love me a dungeon crawl. I thought I'd share my thoughts about what roleplayers can take from the level design found in the Alien Breed games and sunsequently transfer them to their tabletop games. Alien Breed has a simple concept: get the power to the ship running whilst mowing down aliens. To do this you must navigate the dark, metallic corridors of the ship. The cool thing about this is that rather than being a straightforward shooter, you must achieve different mini objectives to get to the next location. For instance, you may reach a door where the power is out so you have to go to another room, kill aliens and hack into a terminal to get the power running. However, the door might be open, but the laser barriers are still operational on the other side and could slice you up into bits if you passed through, so you must find the room with the power generator and destroy it. As a result, you're not just going simply from one room to another- you're taking part in an ever-changing environment. Routes become blocked by debris, an elevator needs a certain fuse to get it running. It makes getting from one place to the next a challenge and pretty fun. This can easily be transferred to your RPG.